Great to start the show with Cabo Wabo, full band version!! Don't think it had been done since Halen in '92. I've yelled at Sammy from the Cantina audience for years, to let me come up and play it. They stopped at the solo though. Loved the Tequila prawns @ dinner. Huge thanks to Eduardo from Sao Paulo, Brazil. We toughed it out on the streets over night for dinner/show tickets. Hi, to Cassie and her brother Nate from St.Louis, who I shared many beers with on the street as well. Great time Great show. Going back next year... Thanks Sammy Happy B-day..
What an awesome show, I was a vigin redhead, but no more! Yes yesterday was for show 1 and 2. Dinner tickets were yesterday? Was that for Friday too? So happy that we got dinner tickets yesterday!!! This is my first time celebrating Sammy's birthday bash. Have tix for first show. 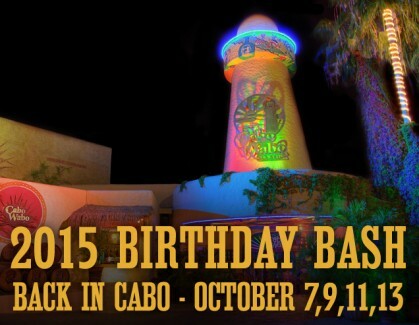 Anyone with any experience attending the birthday bash willing to share with me what to expect? How early should you get there? What is the latest you should go to stand in line? Basically, I am curious what to expect if we go to stand in line at 2:00, how long it typically takes, so I know how to plan the day. Realistically, I would like to go later but not so late that we miss the show. Any input would be appreciated. The majority of places will accept them, but you might get hit with extra fees from your bank since it is in non US currency. The little market type places my experience is no for them. Thank you very much redrocker327, you are always very helpful. Do most places take credit cards? It is best to pay in Pesos as your money will go farther. You can use US Dollar most places give the change back in Pesos and you usually do not get the current rate. The rate exchanging Dollar to Peso is VERY GOOD now last check 17 to 1.
can go Wed. or Fri. - need 2 tix....text if you have any....770 401 5729....thank you. Desperately looking for ticket for the first night. Will pay whatever you want, and buy beers inside!!!! Thanks so much guys. This is my first time in Mexico and I just wanted to make sure I can use American money at the resorts, shops, etc in Cabo or do I need to exchange money when I get there? Congrats to all those that got a tix to the big pachanga' Unfortunately, many of us, not so lucky (year after year). Will be partying it up @ Pedregal. Just Throwing this out there...if your name is Sammy H, Kenny C, Emeril L, or Joe S, ya have an open invite to fish and party on the Viking with us, 10/4, 10/6 or 10/8! I plan on trying to get dinner tickets for the show on the 7th, does anyone know what the ticket limit per person is?? I've booked everything and leave this sat w/ a friend. I know my visa was charged and have proof of purchase. I'm just worried w/out a instructions/confirmation # I won't get in. As long as it is not a professional big lense type should be good. You will have to find two people with an extra ticket. The way ticketing works for these shows the winner has to claim one ticket. You can be the guest of a winner. These are not actual tickets but wristbands placed on the winner and guest after verification. Will be in cabo all week. If anyone has 2 tickets that they are not going to be able to use, I would be thrilled to buy them. The drawings happened a month ago for tickets. You either now will have to find someone with an extra and be their guest or be in Cabo on the 5th to get dinner/show combo tickets which are $90 each and Cash. Those go on sale the 6th for the 7th and 9th shows at the Cantina noon, but from what I hear people start lining up a day earlier. how can I get 4 tickets for the 7th? BUCKET LIST EVENT......I NEED A TICKET TO RITHER OF THE FIRST 2 SHOWS.....770/355/2187...THANKS !! Hey all RedRocker fans! If ANYBODY has two tickets they're want to sell, for the October 9th show, please let me know! I want to take my girlfriend there for our 1 year anniversary!!! At this point you have two ways to score ticket. The first is to be a guest of someone who got two tickets but is alone. The other if you arrive in time is to wait inline at the club to buy dinner/show combo tickets. They are sold on the 6th at noon for the 7th and 9th shows, but the line usually begins the 5th. Have room from LA...Question for you, how do the tickets work for the birthday bash, or more specifically what are the chances or how could I get a ticket to the first night? I was blessed to be able to serve and help some poor in Guadalajara and will be driving down from LA to take the ferry to Mazatlan. Never did I imagine I would be in Cabo the time of the party. Anyways you folks seem very connected so I thought you might be able to help me. Also besides posting out here any suggestions on how to let people know if they need a ride from LA I have room. Helping with gas would help or maybe just donating some clothes for the children I will be helping! You have possibly two chances for dinner/show tix depending on when you arrive. Also they way these shows work someone who won and can't go they are not able to sell off tix. The winner HAS to claim at least one of the two tix. You present ID on the day of show for pick up and get wristbands put on you. If anyone has a single they would like to get rid of for the first night I will take it! For cash of course, and Ill buy plenty of beers inside! I'll be in Cabo all week and would love to get in for the first and second nights, but I was shut out. Just looking for a single.